Drones – unmanned aerial vehicles – raise a host of legal and ethical issues but responsible journalism should be exempted from many legal restrictions, according to international media law expert Dr David Goldberg. Dr Goldberg was co-author (with the ABC’s Mark Corcoran and Oxford’s Robert G. Picard) of the Oxford Reuters Institute for the Study of Journalism report ‘Remotely Piloted Aircraft Systems and Journalism’ in June, 2013. He was addressing the Drones, Privacy and Journalism symposium at the Griffith University campus at South Bank in Brisbane tonight (November 4). 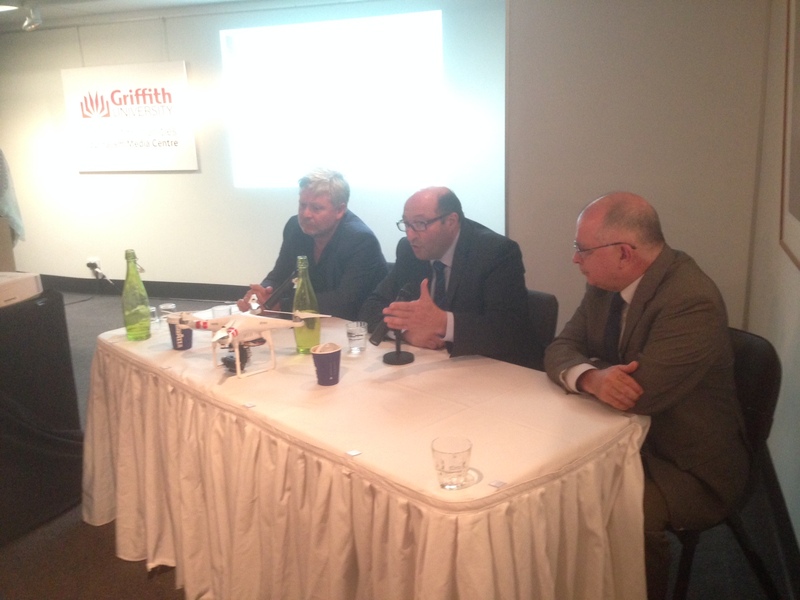 He was joined by former ABC Foreign Correspondent reporter Mark Corcoran (now with ABC News Online and leading the ABC’s drones program) and The Australian’s legal affairs editor Chris Merritt who formed the panel responding to Dr Goldberg’s address. “My claim is that drones both can and pointedly should be allowed to be used for the purposes of newsgathering, journalism and media production,” Dr Goldberg said. 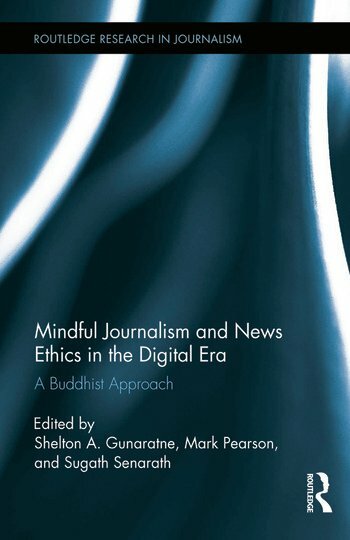 “The reason that they should is that they are basically adjuncts for newsgathering techniques. ‘Drones’— which Dr Goldberg prefers to call ‘remotely piloted aircraft’ (RPAs) — are evolving from predominantly military to civilian applications. The presentations focused exclusively on using RPAs for newsgathering, aka ‘drone journalism’ or, ‘dronalism’. 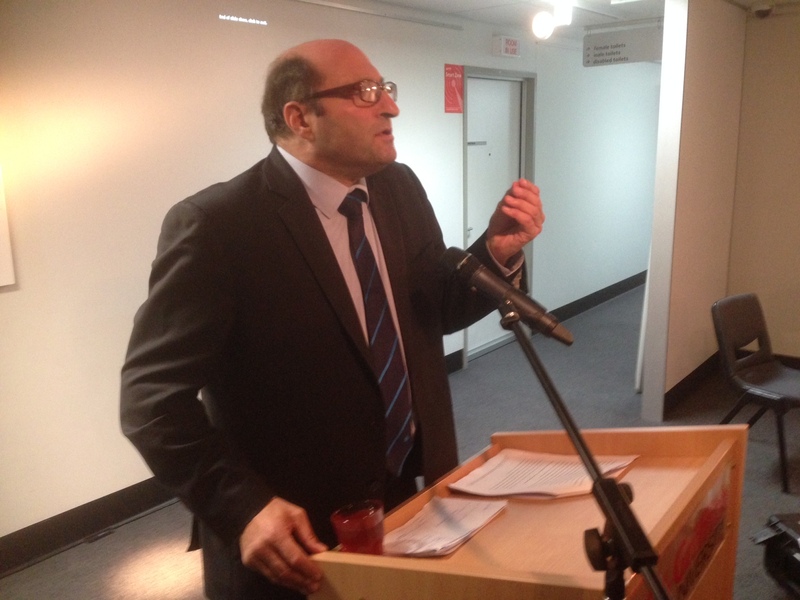 Dr Goldberg displayed Air Services Australia regulations for the G20 event, showing the special permissions accredited media need to be able to use aircraft, particularly “civil unmanned aerial systems”. “Whatever we call these things, the technically correct language of ‘remotely piloted aircraft’ (RPAs) establishes … that they are not unmanned, they are remotely piloted. The fact there is no pink fleshy object in the front doesn’t mean there is no human connection to the object. “They’re called unmanned but it’s far from unmanned. He said there were many regulatory issues to be resolved before drones could be used for reporting in an urban environment. He explained that drones were simply the next stage in the evolution of the camera. He said he was unconcerned about the issue of privacy. “We cannot let the privacy freaks, the privacy lobby, drive the discussion of drones,” he said. He argued the taking of private images had been done for decades. The invention of the Kodak Brownie camera had liberated the image-taking from being a static to a mobile phenomenon and the drone was simply an evolution of that technology. “It may be that some individuals are more sensitive about their images being taken,” he said. He quoted from the recent Australian Law Reform Commission report, Serious Invasions of Privacy in the Digital Era, situating the issue of privacy in the area of serious and systemic intrusions into privacy. He distinguished this from the accidental or incidental capture of images in pursuit of a public interest story. He noted the ALRC had proposed there should be a defence of ‘responsible journalism’. He was concerned the aviation regulator might become a censorship body. “What is the right of appeal to a decision by CASA?” he asked. He noted the UK had imposed a ‘no fly zone’ over the Glasgow Commonwealth Games which meant drones could not be legally used. However, there was the issue of them being used illegally by amateur enthusiasts, or ‘cowboys’. He suggested drones might contain a microchip for identification purposes to assist with regulation. ABC News remotely piloted aircraft research co-ordinator and symposium panellist Mark Corcoran explained he first imagined the use of drones by the media when he saw their use by the Israeli military in the Gaza in 2006. He later saw them used by the US military in Afghanistan as a reconnaissance tool to ensure safety before rescuing troops from a dangerous situation. The advent of the smartphone had generated the boom in the past three or four years, with the ABC making substantial progress in the past year. He said the technology was cheap and highly effective in certain circumstances. Their special advantage was to identify exit routes in dangerous reporting situation. He said the basic investment in an RPA by the ABC was now a relatively inexpensive $1500 when equipped with a camera. He said the recent use of a drone to take footage above protesters in Hong Kong would not fall within the ABC’s guidelines for their use and would not meet Australian aviation regulations. ‘We make a choice under our existing policies not to show certain images – even though they are there,” he said. The ABC was working on its operating procedures. The broadcaster had brought in external operators with CASA approval to fly RPAs. “We need highly specialist people who not only have operating certificates that are cinematographers as well,” he said. 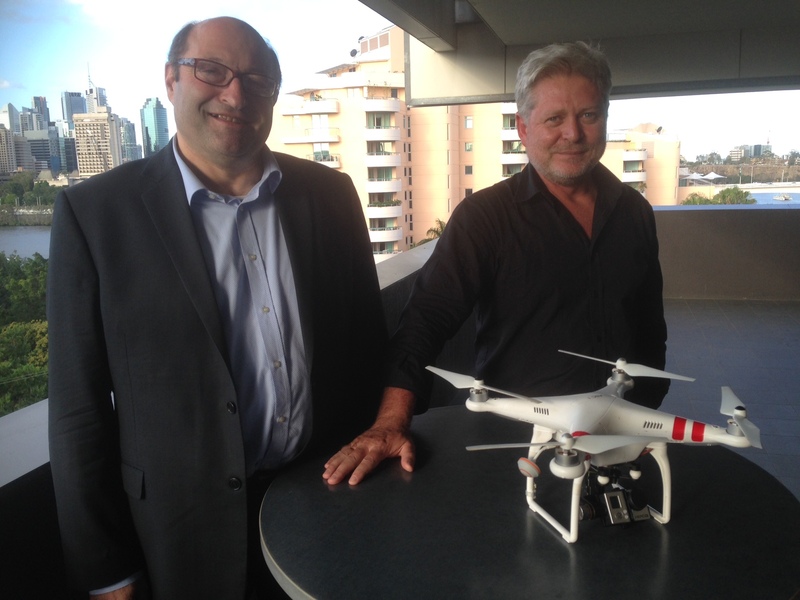 Most of the stories where the ABC had used drones to date had been in more of a documentary style – such as on Four Corners, Australian Story and in special outside broadcasts. “If you can’t get a helicopter it’s fantastic technology. The ABC has a long history in aviation. It is well aware of the risks of aviation. We lost three very good friends in a helicopter crash three years ago. We do get that it’s a complex area,” Corcoran said. He explained that CASA had flagged they would change the regulations for the sub-2kg commercial operation of RPAs. Hobbyists could fly a drone in the park without regulatory concern. “However, if I am a journalist and I want to film an event with that same craft then I need an operating licence,” he said. CASA had determined it was an acceptable risk to do away with the sub-2kg regulations after doing impact tests. “This is a bit like being hit by a flying lawnmower. They can do some damage,” he said. “We’ve put our own regulations around this, we’ve implemented our own trial training regime in anticipation of that change. He said rural and regional Australia was where the ABC could best realise the potential of the technology. “At the end of the day this is an aviation activity – it’s not just a flying smartphone,” he said. Panellist Chris Merritt – legal affairs editor of The Australian – said the ALRC had not properly examined the question of whether Australia really needed a privacy tort. “Lawyers have a natural disposition to see the formal court process as a way of solving society’s ways,” he said. But this would not work for the media or the ordinary citizen. He pointed to media exemptions under the Privacy Act as a model for handling the privacy issues associated with responsible media use of drones. “The issue’s not going to go away – there are breaches of privacy by the media,” he said. 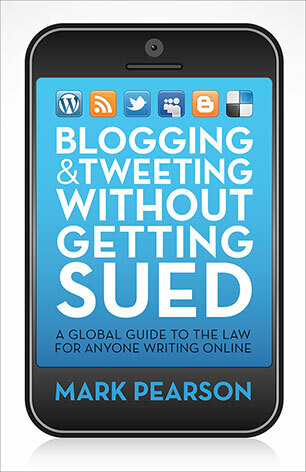 “When Lord Leveson it became clear to me that this is something that the media can’t ignore. It’s a problem. He said “tabloid television programs” were the worst offenders, but the federal regulator of these programs does not use the mechanisms that are in place. We are honoured to be hosting acclaimed international media law expert Dr David Goldberg for two seminars examining the law and ethics of media use of drones early next month (November 3 and 4). Former ABC Foreign Correspondent reporter (now with ABC News Online) Mark Corcoran and The Australian’s legal affairs editor Chris Merritt form a panel responding to Dr Goldberg’s symposium address at South Bank in Brisbane on November 4. Former Gold Coast Bulletin editor (now Griffith University communications and marketing director) Dean Gould and I will be panellists for the Friends of the Library event at Griffith’s Gold Coast campus on November 3. Attendance at both events is free, but registration is required at the links detailed here for the Brisbane event (Nov 4) and here for the Gold Coast event (Nov 3). Both presentations start at 6pm, with guests asked to arrive from 5.15pm for the Brisbane event and from 5.30pm for the Gold Coast presentation. 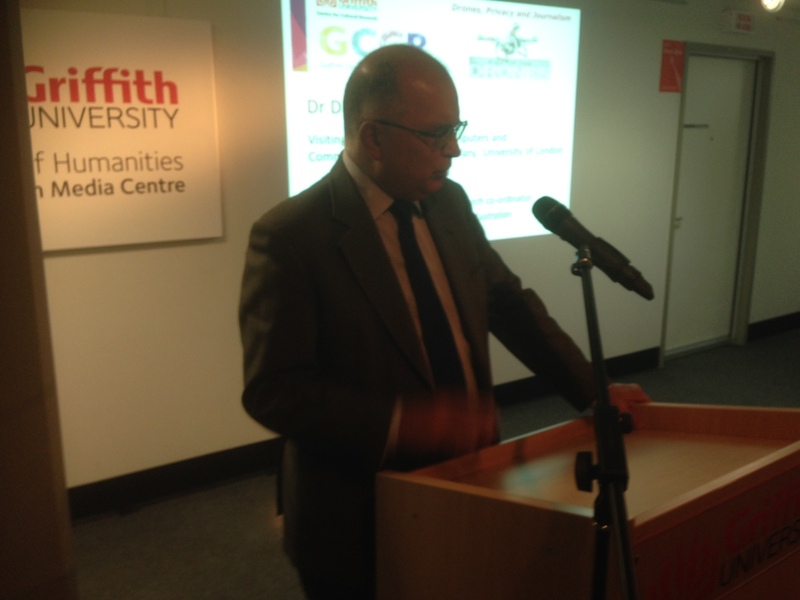 The Brisbane symposium is hosted by the Griffith Centre for Cultural Research (in conjunction with the Socio-Legal Research Centre) and is the opening function for Griffith Journalism’s student coverage of the G20 summit from its Media Centre in South Bank. 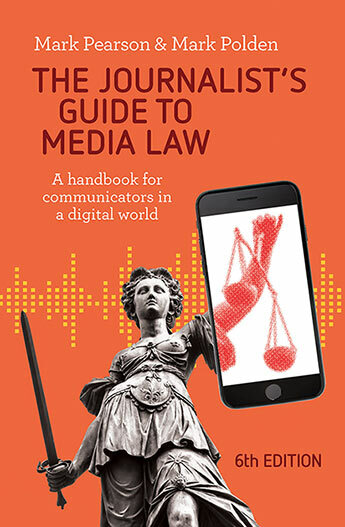 Dr Goldberg is co-editor (with Gavin Sutter and Ian Walden) of Oxford University Press’s Media Law and Practice (London, 2009). 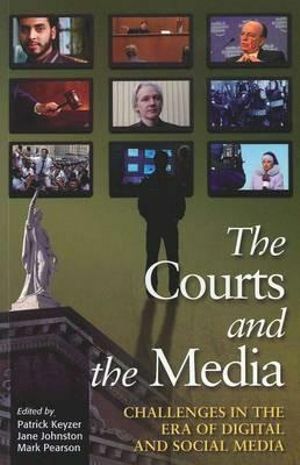 He is also Adjunct Associate Professor of Law at Southwestern Law School, Los Angeles and Honorary Visiting Senior Fellow, Institute of Computer and Communications Law, Queen Mary College, University of London. ‘Drones’— which Dr Goldberg prefers to call ‘remotely piloted aircraft’ (RPAs) — are evolving from predominantly military to civilian applications. The presentations focus exclusively on using RPAs for newsgathering, aka ‘drone journalism’ or, ‘dronalism’. As Dr Goldberg explains, “Cheap, light and portable, RPAs can easily be moved to locations where reporting needs to take place or production is most desirable and, crucially, can keep journalists safe. “In this context, RPAs are simply 21st Century aerial camera platforms. In the presentations, he urges that the public’s right to receive information from journalists exercising the rights involved in carrying out the profession of reporting—and the concomitant right to access communications technologies in order to do so — should permit the use of RPAs in this context in principle and trump counter-claims, not least those advanced by the pro-privacy lobby. The Friends of the Library presentation with Dr David Goldberg, media law, ethics, privacy and free information expert will discuss drone technology focusing on media usage in major events like the 2018 Gold Coast Commonwealth Games. The Griffith Centre for Cultural Research (GCCR) welcomes media, law, ethics and free information expert Dr David Goldberg to discuss drone technology, focusing on media usage in major news events. Special guest panelists include Mark Corcoran, a respected reporter and producer for the ABC’s ‘Foreign Correspondent’ and Chris Merritt, Legal Affairs editor for The Australian.